1979: Saia Communications, Inc. (formerly Communications LTD.) has been in the 2-Way Radio business since 1979, where we started out of our home in Chaffee, New York doing repairs on various brands of two-way radios. 1983: Saia Communications, Inc. hires first employee (Bruce Heineman), erects first 200' guyed tower in Franklinville, NY. The site consisted of a 200' Rohn 55 tower and a 6' X 6' equipment shelter. 1988: Saia Communications, Inc. expands out of the house and into our present Chaffee facility located at 12530 Olean Road, where we continued to grow in the field of repair services, sales, rentals and tower services. Communications LTd. changes name to Saia Communications, Inc. and incorporates business. 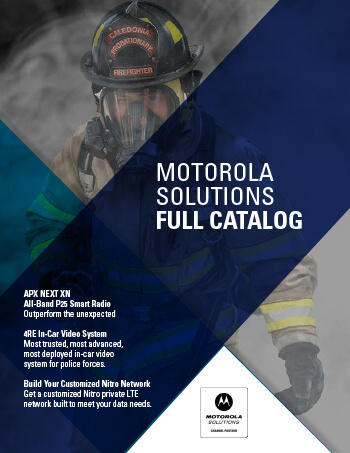 Saia Communications, Inc. became a Motorola Authorized Dealer Representative for sales of Motorola Branded as well as the Motorola Radius Line of two-way radios and accessories. 1995: Saia Communications, Inc. constructs its first 800 MHz Motorola Privacy Plus trunked radio system in downtown Buffalo, New York. 1996: Saia Communications, Inc. opens second full service location in Buffalo, NY becoming WNY Largest Motorola Two-Way Radio Dealer of Sales and Service. 1997: Saia Communications, Inc. becomes a "preferred subcontractor" for Motorola National Service. Saia Communications, Inc. enters first ever national FCC auctions for 900 MHz SMR frequencies and wins 2 blocks for the Buffalo MTA. (Metropolitan Trading Area). 1998: Saia Communications, Inc. constructs first 900 MHz Motorola trunked system in Buffalo, New York and within 6 months expands its 900 trunked systems into Rochester, Attica, and Machias, New York. 2001: Saia Communications, Inc. moves into a newly renovated 14,000 sq. ft. facility from our previous Buffalo facility (4,500 sq. ft.). Saia Communications, Inc. has ten factory-trained technicians and installers familiar with the complete line of Motorola equipment as well as other support equipment for the industrial and commercial industry. Motorola appoints Saia Communications, Inc. as an authorized Centracom-Elite Console Dealer and permits Saia to build and market Motorola's Premier Mobile Data System. 2002: Saia Communications continues its expansion of tower sites acquiring two additional sites in upstate New York. Orangeville, NY and South Bristol, NY towers are added. Seeking a future need to connect all of their tower sites, Saia Communications begins the process of installing microwave radio equipment. Sending technicians to Proxim's technical training programs, Proxim appoints Saia Communications as an Authorized Proxim reseller and installer of their microwave equipment and wireless product line. Saia Communications begins to offer commercial software for 2-way radio shops, custom software and other IT services. 2004: In Saia Communications' continuing efforts to provide quality products and services to our customers in Western & Central New York, 2004 brings with it several new items. 2006: Motorola, Inc. awards Saia Communications the prestigious award as a MOTOSTAR dealer. Saia Communications engineers, design and install a 6 site VHF analog simulcast system (law enforcement) in conjunction with a 6 site low band voted system for the fire services in Wyoming County, NY. 2007: Olean is added to the list of sites available to all SaiaNet customers. AVL/GPS tracking is a welcome addition to the SaiaNet system, using a single radio that provides both voice communications & fleet tracking in one unit. Saia picks up Code 3 line of emergency warning equipment and begins offering installation services for this type of product in police and fire service vehicles. 2008 Saia becomes a Motorola Manufacturer’s Representative and is authorized to sell Motorola equipment on New York State Contract. 2009: Rochester, NY and Jamestown, NY are added to the list of sites available to all SaiaNet customers. An upgraded, web based AVL/GPS tracking system is brought on-line for customers of the SaiaNet system who require the tracking and logging of their vehicles. 2010-2011: Installation of two new towers in Allegany County (Wellsville, NY & Andover, NY) for the development and build out of the SaiaNet trunking system. Angelica, NY tower site is developed as part of the SaiaNet expansion. 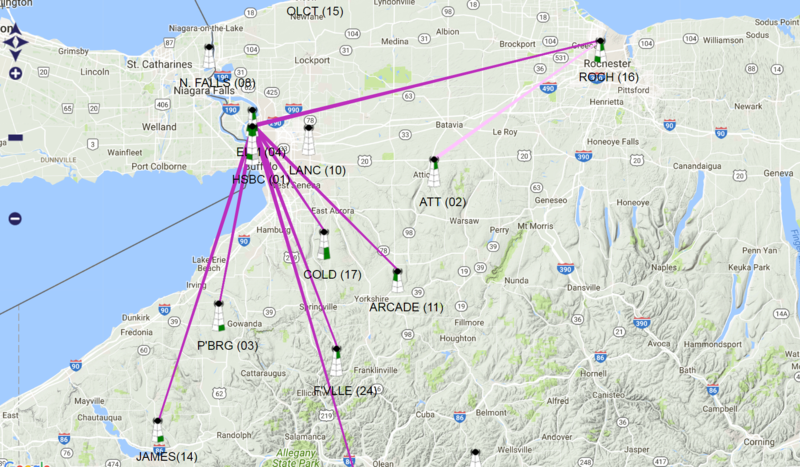 Saia Communications is instrumental for Phase II in the design and implementation of the Motorola 4.9GHz PTP (Point To Point) 27 site backbone, connecting all of Erie County's tower sites as part of the P25 system upgrade. Saia begins the engineering & design of Motorola's latest digital wide-area trunking platform called Connect Plus. Long term plans call for an overlay of the existing analog SaiaNet system to operate in harmony with the new Connect Plus commercial digital system (known as TRBO) using the same infrastructure and backbone. 2012: Olcott, NY SaiaNet site is turned up and becomes another site in the continued expansion of Saia's wide-area trunking network. System software upgrades and replacement of old microwave backbone equipment begins in the third quarter of 2012. 2013: Saia begins the implantation, build out and migration of Motorola’s digital wide-area multi-site trunking system. Initially six sites (Buffalo-2, Rochester, Attica, Perrysburg, Machias) are activated and placed into service. With digital trunking Saia can now offer with the trunk system much faster roaming between site, text, GPS for both mobile & portable radios and many features not available with an analog radio. Saia becomes a Motorola Solutions Premium Service Provider. Saia adds Federal Signal Corporation line of emergency warning products. Saia is awarded an RFQ from Wayne County to upgrade its VHF simulcast system from a 4 site, 2 channel system to 6 site, 4 channel simulcast system. The addition of a County wide SCADA system and upgrade their microwave backbone system from a 5.8 GHz unlicensed to 4.9 GHz engineered backbone using Cambium’s latest PTP650 radios. 2014: Saia becomes Code 3 Master Distributor for Western New York. The migration from analog to digital trunking begins. Saia invests in a comprehensive upgrade of their microwave backbone connecting all of their primary towers. The microwave links are replaced with 11GHz licensed links. Modification of analog licenses in preparation to convert channels to digital operations begin. In an effort to maintain service to those existing subscribers using analog radios without interruption, incentives are offered to migrate customers from Saia’s analog channels to digital channels, freeing up channels, doubling resources by converting an analog channel to digital. GPS tracking, texting, smartphone interfacing are features incorporated with the new digital network.